My daughter and I were out doing a little summer shopping when I ran across this maxi skirt at Tilly's. The first thing that caught my eye was the color. I adore aqua! It makes me think of spending a relaxing day at the pool or beach. The color just makes me happy. To make this skirt even better, the fabric is a super soft rayon blend. It drapes so beautifully I could not resist and had to have it. I hate to admit it, but when I find a piece of clothing (or shoes) that I really like, I buy it in as many different colors as I can. That may seem kind of boring to some, but since comfort is high on my list of fashion priorities, I can settle for boring. Unfortunately, my new favorite skirt wasn't available in any other colors. Now what? After staring, measuring and analyzing my skirt I decided that it wouldn't be that hard to re-create if I could just find some beautiful fabric. I jotted down the fabric composition and headed off to the fabric store. The good news - it didn't take long to find the kind of fabric I needed. The bad news- it was only available in black, olive, maroon, and off-white. There were no pretty patterns. I probably stood there for 20 minutes trying to determine my plan of action. I settled on the off-white fabric. If I can sew a new skirt, there's nothing stopping me from dying the fabric, too. Maybe that's a good thing. Then I can get exactly the color I want. When I got home, I sketched out my plan. The skirt is made of two pieces of fabric that are slightly tapered rectangles, and has an elastic waistband. After measuring again and accounting for seam allowances I cut two rectangles that were 21.5 inches wide by 39 inches long. 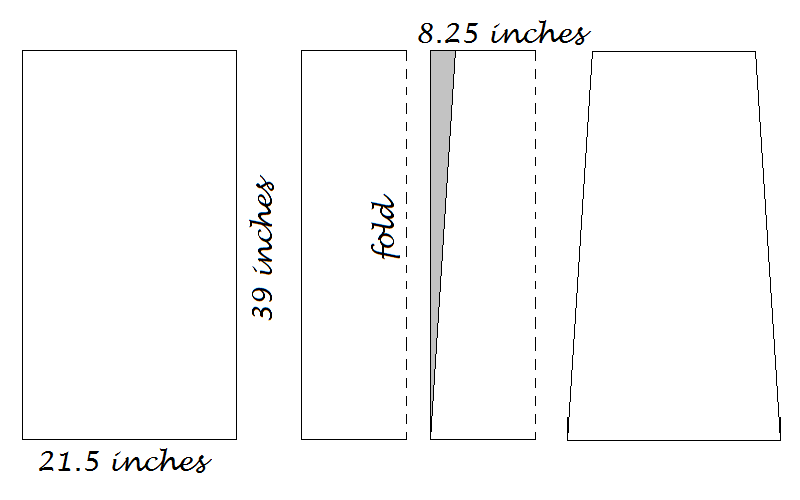 I folded each rectangle in half lengthwise, measured over 8.25 inches from the fold, and drew the tapered edge with a fabric pen. Cut, cut, cut and open the fabric... the two skirt pieces. Get out the sewing machine. Serge the edges. Stitch the hem. Attach the front to the back. Insert the elastic. Shazam! It's the same skirt. All I need to do now is dye it. I've tie dyed shirts before. My problem is that I want to make sure the dyed design is as cool as the original skirt I purchased. 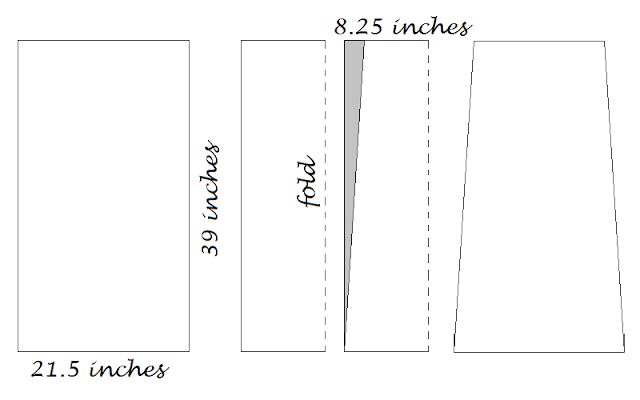 So I did a little internet research and quickly realized that there is no single source where you can compare different folding techniques and the results they create. So, before I dye my skirt, I need to do a little investigation about various tie dye techniques. The good news for you is that my research will definitely lead to a colorful post or two about tie dye. Ideas and Inspiration - Sewing and tie dying a rayon/spandex maxi skirt for summer.